Anthony Bourdain has revealed the first thing he does upon arriving in a city he's never visited, and it's as Anthony Bourdain as anything he does. In an extensive profile published in the new issue of Men's Journal, the often outspoken celebrity chef and wandering eater of "Parts Unknown" said his first order of operation when visiting a new place is hitting up one of its most authentic cultural spaces: its main food market. "You see what's for sale, you see what's in season, you see the fundamental color palette of a cuisine," Bourdain said in the story, which is worth a read. "You really get a sense of what a culture loves most dear." You know, the opposite of hitting the hotel bar or any chain restaurant you'd consider a creature comfort. 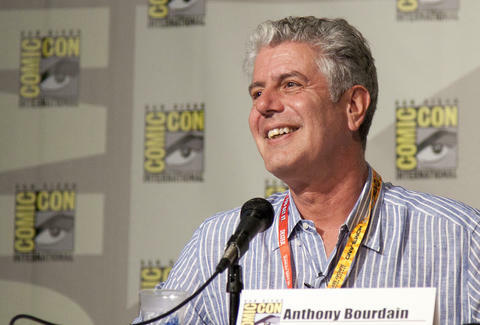 It should come as no surprise that Bourdain plans to open a massive food market of his own -- aptly named Bourdain Market -- in New York City as soon as sometime next year. The market will reportedly span 100,000sqft and will likely be located at Pier 57 on Manhattan's West Side, and Bourdain wants to make clear it's going to be more than a mere food court. "There will be butchers and produce and fishmongers," he said in the story. "It will serve an important, everyday function. Its heart and soul will be Asian, but I've also been recruiting Mexicans, Peruvians, Brazilians. It's going to be independent mom-and-pop stuff they've been doing for generations, at an affordable price." But knowing Manhattan grocery rates, we'll just see about that. As for the first thing he does in cities he's already visited, Bourdain takes a nap so he's refreshed for dinner. Smart man. Tony Merevick is Cities News Editor at Thrillist and typically seeks alcohol after he deplanes. Send news tips to news@thrillist.com and follow him on Twitter @tonymerevick.